If you want to eat the best fish tacos in NYC, you're going to have to get out of Manhattan and hit the beach - Rockaway Beach in Queens, the last stop on the A Train. Here you'll find Tacoway Beach (a restaurant, not a beach, located inside of a surf club). Confused? Allow us to explain. After last season, the original Rockaway Taco permanently closed. They have since reopened inside of Rockaway Beach Surf Club, and changed their name to Tacoway Beach. Don't worry - the food is exactly the same as it used to be. It's still the same ownership, still serving the same excellent tacos. But this situation is a serious upgrade in terms of setup as compared to the old location. In addition to the taco stand, there are two bars - one inside, and one outside - and plenty of seating for optimal taco consumption. The scene at Tacoway Beach is also quite ridiculous. Located a block from the water, it's a melting pot of humanity in the best possible way. Surfers, hipsters, locals - all the cool kids hang out here. 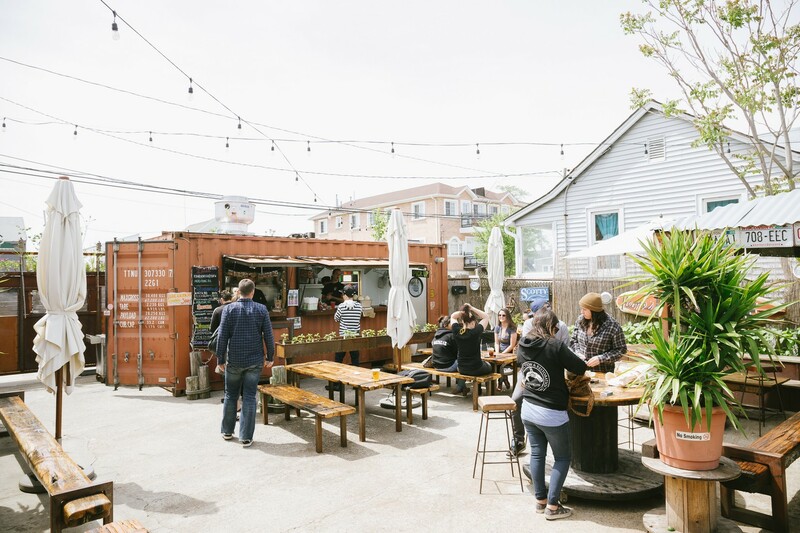 If there's one place to be in Rockaway, this is it. First and foremost, the Rockaway Taco structure is impeccable. The tacos maintain an even balance of well distributed filling that makes for a clean and enjoyable eating experience. Each bite is neat and precise. There isn’t much mess, and they’re really just a pleasure to do business with. We recommend ordering all tacos deluxe with just the right amount of guacamole on top. Flaky tilapia is heavily battered, fried, and served super crispy in a corn tortilla with slaw, crema, radishes, and lime. Heaven. They only serve three tacos - fish, chorizo, and tofu (hence, "Perfect For" Vegetarians tag), and while we don't necessarily suggest doing anything other than ordering as many fish tacos as your body can handle, we also understand if you need a little variety in your life. The chorizo tacos are solid, as are the tofu. This one goes out to all the vegetarians out there. Tacos exist for you too. Their guacamole is creamy, delicious, and addicting. Their sweet plantains are equally as enjoyable. The only problem here is that you'll be in need of a plantain refill really quickly. Slices of cucumber, mango, and jicama with chili and lime. This is a good option to share. Plus, you feel like you're eating healthy. Watermelon Juice = mandatory complement to fish tacos. The fresh pineapple mint juice ain't bad either. Get a beer. Get a juice. Get tacos. Repeat. They’re good, but this is not the reason you came all the way out here. A bowl of corn kernels, topped with lots of cotija cheese. You definitely need this. Only available on weekends between the hours of 9am and 11am, before they start serving tacos. Breakfast consists of a fried egg served over chilaquiles and chorizo if you so choose. This is not a light breakfast, so hopefully you’ve got a half hour to kill before diving into the ocean. Rumor has it breakfast tacos are in the works too, which would be big news. Mexico 2000 used to serve food in the back of a bodega near the BQE in Williamsburg, and now they have their own restaurant next door.